Building Hoist Elevator, which is called hoist for short, is widely used in the vertical hoisting of personnel or materials. It is indispensable transportation equipment with good performance in industry, civil architecture, large-scale bridge and silo, which can also be permanently or semi permanently used in different situations such as warehouse, high tower and etc. This product is steadier, safer and more reliable compared with other hoisting machines and it has the advantage of convenient disassemble and fast moving without apparatus room or well path additionally, especially playing an important role in labor saving intensity, expediting project process and improving working efficiency. As an engineering machinery supplier in China , provides not only quality construction equipment but also A-class services. Even Ketong already have 6 years history, but we always pay attention to quality same as the first day , we have good experience workers and engineers team.Engineers supply the best design drawing paper , workers team can understand well and fullfill totally accord, after finish we have QC to test the quality and surface treatment , after confiming everything is ok ,then we can load the container . 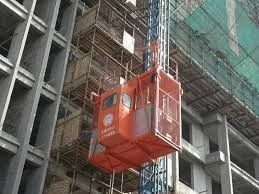 We exported when we established.We produce Suspended working platform as first , 5 years ago our team begin to deal building hoist , and 2 years ago we have new products tower crane , we are keeping moving ,never stop, only would like to supply the best quality ,price and service to each KETONG client.